Now you can combine the architectural beauty of a pergola shade structure with the retractable shade features of a ShadeTree� Retractable Canopy System. Whether you have an existing pergola or are starting from scratch, our canopies are a beautiful way to add more functional shade. Building your own pergola or retrofitting an existing patio cover or pergola? Canopy and track kits are available to fit under or between the rafters. For more information visit our pergola shade pages. Looking for a structure that has the architectural beauty of a pergola with the retractable features of a ShadeTree Canopy System? 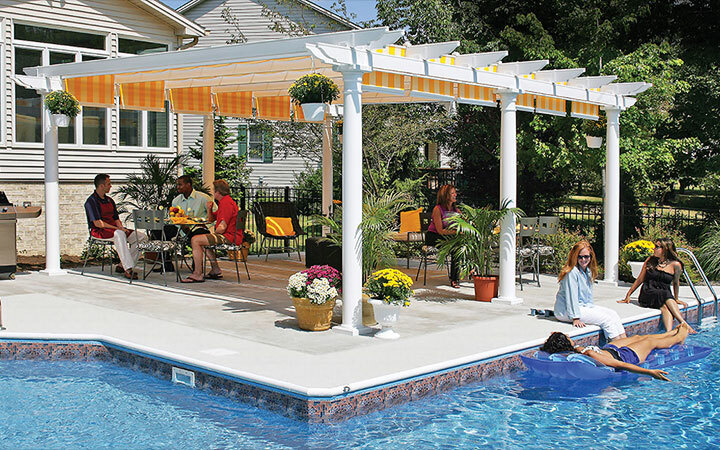 Introducing our exclusive ShadeTree pergola kits, featuring ShadeTree� Retractable Canopies. These pre-cut, pre-drilled pergola kits are made of low-maintenance vinyl or powder-coated aluminum and can be used as a free-standing structure, or attached to your house or building. No pitch is required, with unsupported spans up to 24 feet. (Larger areas can be covered with additional columns.) 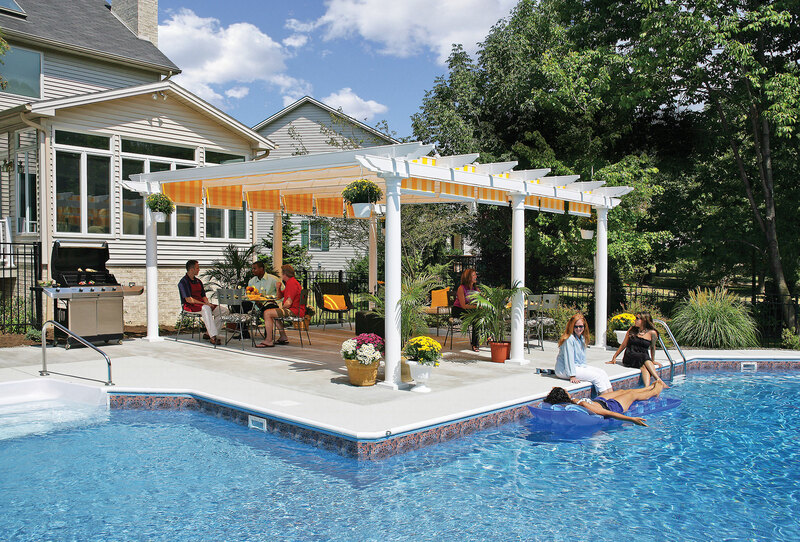 Pergolas are available in a variety of styles and colors and can have round or square columns. Custom-made, any size to fit your deck or patio. Our on-staff computer-aided (CAD) designers are also available to create custom designs. The 30" ShadeTree� Retractable Canopies can be in your choice of over thirty handsome fabric colors. To see various size options, visit our vinyl pergola on-line estimator. Our unique, vinyl 2"x 6" track profile incorporates a channel for ShadeTree� retractable canopies, and includes decorative hardware and columns creating an architectural statement on your patio or deck. 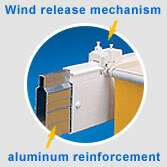 When extended, each ShadeTree� canopy section is held in place by a patented "wind release" mechanism. If left unattended and heavy winds come up, the mechanism releases the canopy, allowing it to move freely in the tracks to reduce risk of damage. All vinyl beams are reinforced with heavy-gauge aluminum for strength and durability, allowing spans up to 21 feet. If you have an existing pergola, or want to build your own wooden pergola structure, we can work with your measurements to provide you with strip track or under-beam tracks and custom canopies cut to fit any shade structure. We also offer Trex pergola kits using TrexTrim pergolas and our single sided strip track system.